These walrus whisker toothpicks are made by an Inuit artisan in Alaska. They come in assorted styles. The toothpicks are approximately 3" long by 1/8" wide, and weigh 0.1 oz. Please see the picture below for available toothpicks in stock. You choose the exact one you want to purchase. Genus and species: Odobenus rosmarus. Wild. 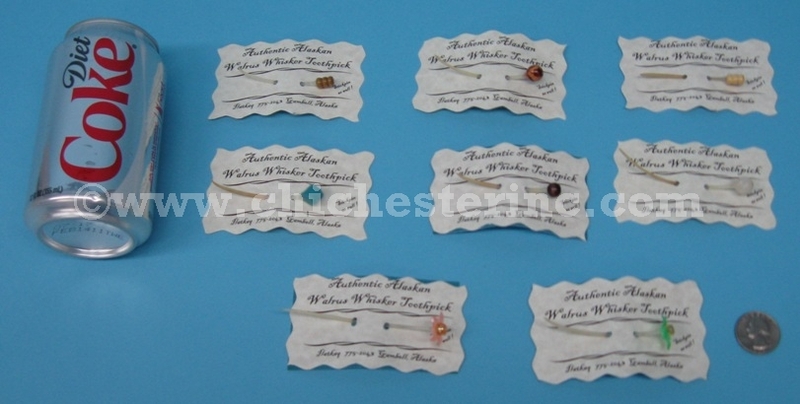 These are the walrus whisker toothpicks we have in stock and are available for sale. You can choose the exact toothpick you want. If you do not have a preference we will choose them for you. We will mark off the ones that have been sold.